The Brandenburer Tor (Brandenburg Gate) is also shown. 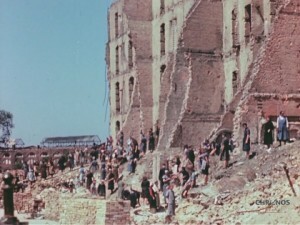 It has suffered some damage and one section has a hole it in where it must have been hit by a shell. Some of the stonework has fallen away, and the bronzework chariot on the top is also showing battle injuries. It is clear from the video that the military is maintaining a visible presence in the city. Soldiers are present on the streets and signs designate the boundaries of the different sectors (British, American, Russian) into which Berlin was carved at the end of the war. 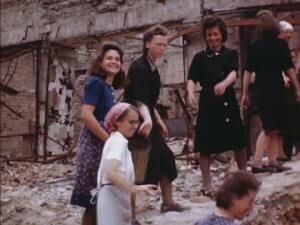 Some people in the video are shifting buckets of rubble down the human chain, and despite the fact that this must be physically exhausting and repetitive, some of them have genuine smiles for the camera. One can only imagine that they must feel some joy that the terrible war is finally over. 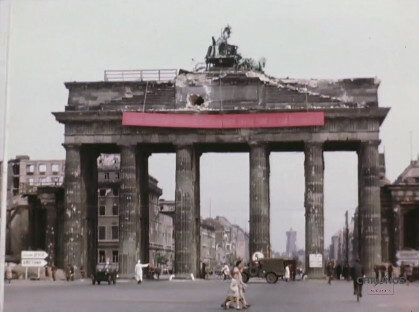 Berlin and Potsdam after the apocalypse in colour and HD – 30 minutes duration. from Konstantin von zur Mühlen.